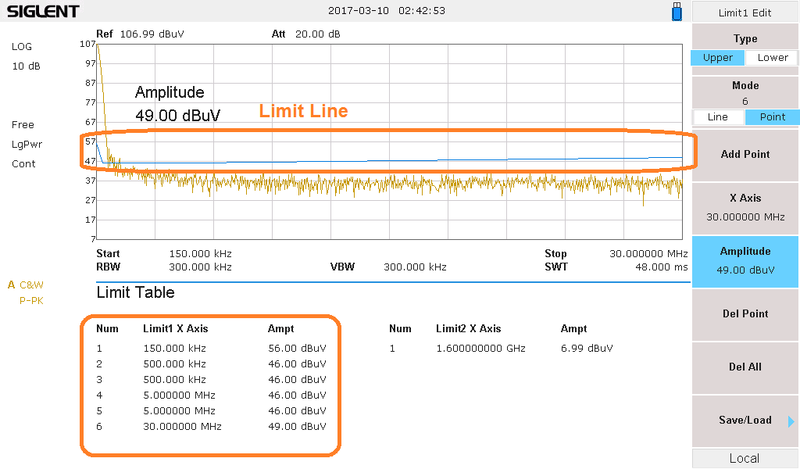 The SIGLENT SSA3000X series of spectrum analyzers feature two limit lines that can be used to visually identify whether a signal or spectrograph meets or exceeds given parameters. 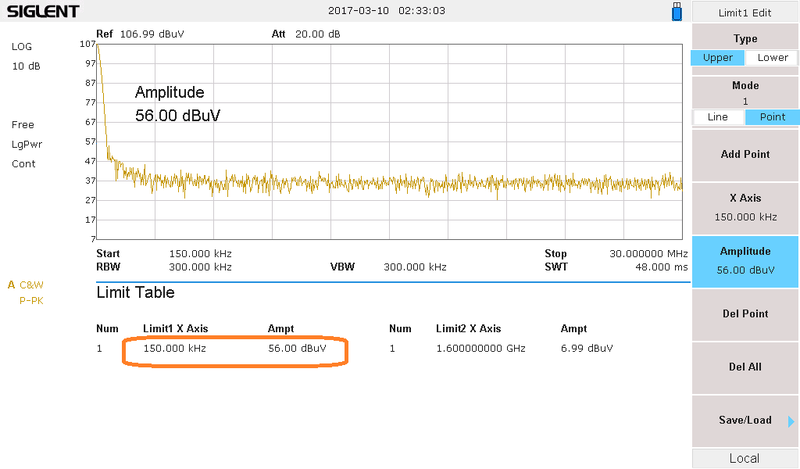 – Transmitter testing: Is the signal in the proper band? – Each limit line can be either an upper or lower limit. Upper limits define maximum values and lower limits define minimums. – Each limit line has two modes: Line or point. Lines are single lines that exist at a user defined amplitude. Point defined limits are build using line segments and can be used to build complex limits, like NRSC masks. In this FAQ, we are going to build an upper limit line based on the conducted emissions for a class B unintentional radiator per the FCC Subpart 15 regulations using the point method. 1. 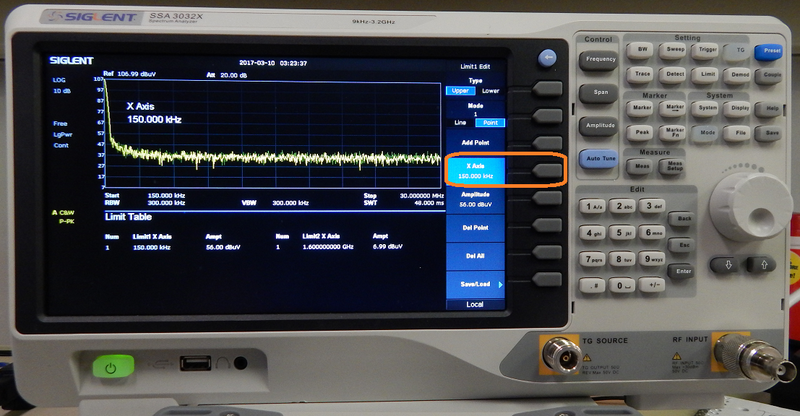 Configure the instrument to cover the frequency span of interest (150 kHz – 30 MHz, in this case) by pressing the button marked Frequency on the front panel and entering the start and stop frequencies. 2. The limits are given in amplitude units of dBuV. To set the SSA units, press Amplitude and set Units to dBuV. 3. Press the Limit button to open the Limit menu. Set Limit1 to ON to activate the Limit menus. 7. Press the grey colored soft key next to the entry labeled Amplitude and enter the Average start amplitude, 56 dBuV. If using a Quasi-peak detector, use the Quasi-peak values of the chart. 8. Press Add Point and enter X Axis and Amplitude values for the second point, 500 kHz and 46 dBuV. Now, we have two points (1 and 2) form the first line segment of the limit line. 9. Press Add Point to enter the third point, which corresponds to the start of the second line segment. Note that the end point for one line segment has the same value as the starting point of the next line segment.